As part of our 25th Anniversity Celebrations we recorded a CD to go along with the other Kitearn Fiddlers' CDs. The album features seven tracks recorded by the current Kiltearn Fiddlers at Tulloch Castle, Dingwall in February 2015. There are also an additional three tracks from former members, Graham MacKenzie, Katie MacKenzie, and Matheu Watson. A track has also been provided by David "Dagger" Gordon. Dagger teaches a weekly guitar class for Feis Rois and has often supported the Kiltearn Fiddlers and encouraged his students to learn to accompany the Fiddlers. 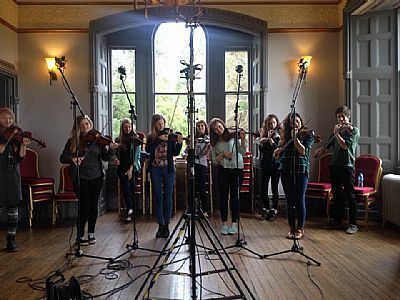 Here we are in initial recording at the Tulloch Castle Hotel in Dingwall. The CD's are sold at our live events but we also are now making an online presence with these new cd's, and ae selling them on bandcamp so they can reach a wider audience.